dhazardous - Portland, OR Must Have "Handy to have a couple of boxes of these in your toolbox, you never know if one might break!" KnightMoves - Shreveport,Bossier City,LA. 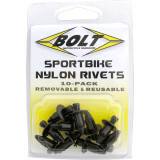 Bolt M8 Nylon Push Rivets "Another great product from Bolt. 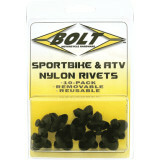 Heavy Duty reusable push rivets, I use them on my dirt bikes, 3 & 4 wheelers, crotch rockets, and my old 88.5 Samurai."